This solution is designed to provide an additional layer of security to those who often connect to remote Linux or Unix servers via SSH or Telnet. Acting as an intermediary between the client and the server, Dekart Terminal Logon can quickly become an administrator’s best friend, adding the ability to securely store multiple user accounts on a broad range of smart cards and tokens. Terminal Logon comes with a FREE license for Dekart Key Manager, which enables you to create encrypted backups and easily manage the keys. File and folder encryption software that seamlessly encrypts sensitive information. You can easily encrypt your private documents directly from Microsoft Word, Excel and PowerPoint applications, as well as enjoy fast and convenient encryption of all types of files using Windows Explorer. With this file encryption software you get the peace of mind that your documents are protected. If your notebook or portable drive gets lost or stolen you can rest assured that all your files remain protected with unbeatable AES 256-bit encryption. Increased Data Portability – Secrets Keeper allows you to work safely with your private data from any machine or removable media. Dekart Secrets Keeper creates an executable file which can be opened on any PC. This means that you can decrypt your files on any computer, without having to install the application, regardless of the media you use (USB flash disk, CD, DVD, external HDD, etc. ), or the way you transfer the files (email, network, removable disks…). Dekart RSA Cryptographic Provider integrates into the Windows operating system and enables you digitally sign and encrypt/decrypt Microsoft Outlook and Outlook Express emails, as well as get access to protected web sites. 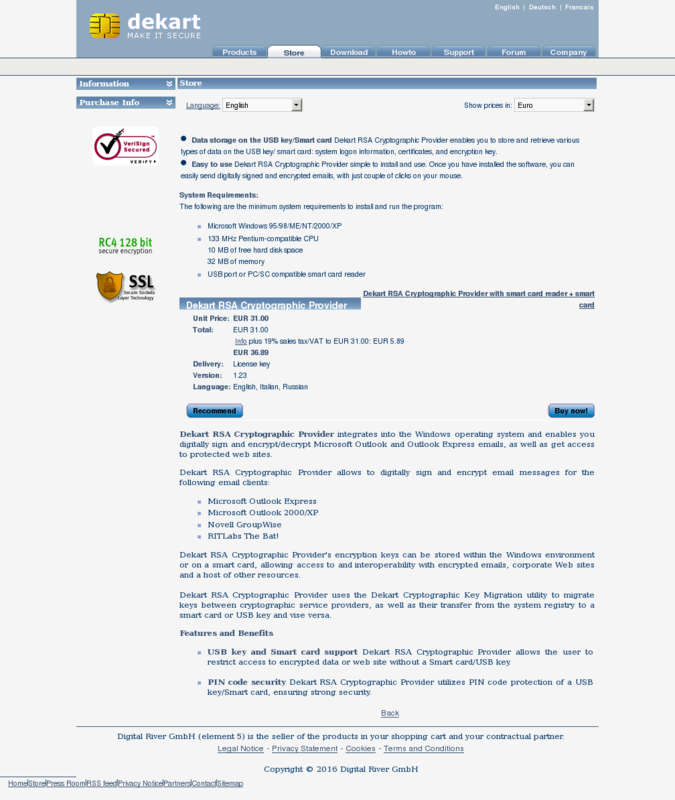 Dekart RSA Cryptographic Provider’s encryption keys can be stored within the Windows environment or on a smart card, allowing access to and interoperability with encrypted emails, corporate Web sites and a host of other resources. Dekart RSA Cryptographic Provider uses the Dekart Cryptographic Key Migration utility to migrate keys between cryptographic service providers, as well as their transfer from the system registry to a smart card or USB key and vise versa. USB key and Smart card support Dekart RSA Cryptographic Provider allows the user to restrict access to encrypted data or web site without a Smart card/USB key. PIN code security Dekart RSA Cryptographic Provider utilizes PIN code protection of a USB key/Smart card, ensuring strong security. Dekart Logon for Lotus Notes provides a complete solution for strong authentication specifically designed to protect access to Lotus Notes. With tokens and smart cards that store Lotus Notes ID-file, passphrase and biometric data, and tight integration with Lotus Notes, Dekart Logon for Lotus Notes lets you easily and cost-effectively eliminate the password risk. Dekart Logon – is a software program designed to add the strong authentication and convenience to the standard Windows logon procedure. It allows to access Windows driven computers and domains in an easy, fast and secure way by using different types of hardware keys. The login and password of the user are entered automatically once the hardware key is connected to the computer. Users gain the flexibility to select from different smart cards, hardware tokens, as well as USB flash drives and other types of removable media to provide fast and convenient two- or three-factor authentication within their Windows environment. Multi-factor Authentication: users can be positively identified for access to Windows resources via a wide range of digital identity credentials and biometric devices. Dekart logon allows to enjoy either two-factor or three-factor authentication, ensuring that only authorised users will get access to their data. This level of security cannot be provided by simple password based solutions. Secure Workstation: Dekart Logon can be configured to lock the workstation or to log off from Windows upon removal of the card, hardware token or USB drive. No need to remember logins, passwords and domains: all logins and passwords are securely stored on the smart card, hardware token or USB flash drive, easily connected to the computer. Easy and Automated access: users enjoy one-step authenticated access to Windows resources; the authentication is fully automatic and fast. No mistakes trying to manually enter complicated passwords. Hardware variety: the ability to choose from a large variety of supported devices, from different vendor’ smart cards and tokens to ordinary USB flash drives, allows choosing the device which would best satisfy user’s needs. (Supported smart cards, tokens, biometric devices). Authentication for multiple users and domains: Dekart logon can be configured to allow access to several workstations and domains with the use of a single card. Alternatively, the system can be set up to allow several cards to access a single computer. This flexibility makes Dekart Logon suitable for a wide range of business scenarios and environments. 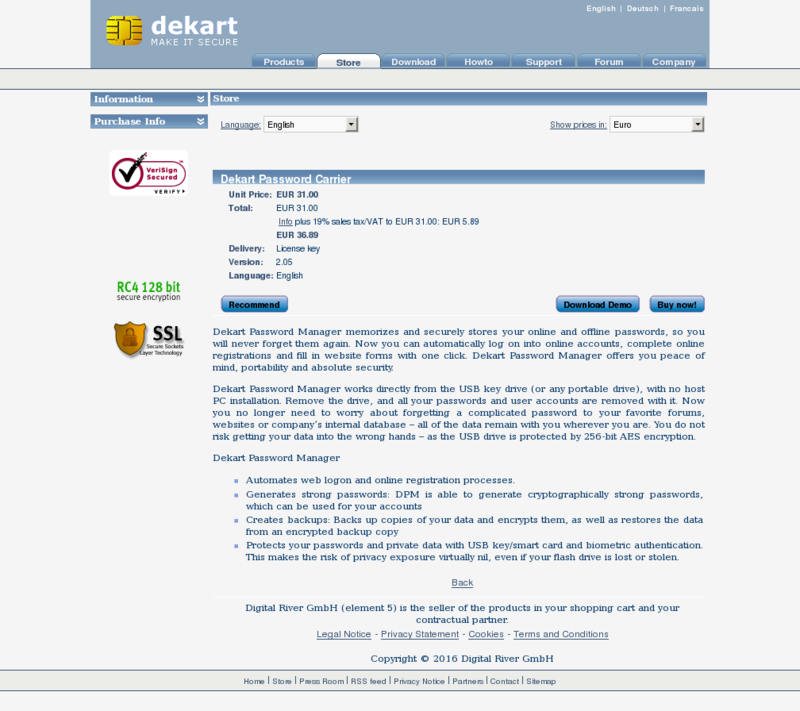 Cost-effective pricing: Dekart Logon costs as low as $39 – business license and $19 – student license. Volume discounts apply. The software allows to save helpdesk and password management costs and improve convenience of users. Dekart Key Manager is a versatile management tool for USB keys and smart cards. It works with a wide array of devices from various vendors. Dekart Key Manager simplifies the process of management of Dekart multifactor security solutions within the enterprise. This is a tool for administrators charged with the challenging task of management of hundreds, sometimes thousands, of USB keys and smart cards. Dekart Key Manager creates a back up copy of the USB key or smart card and stores it in protected file. The protected file can be stored in a secure location. If the user loses the device, Dekart Key Manager will create a replacement copy from a back up. The user will not lose valuable data and access to protected resources. 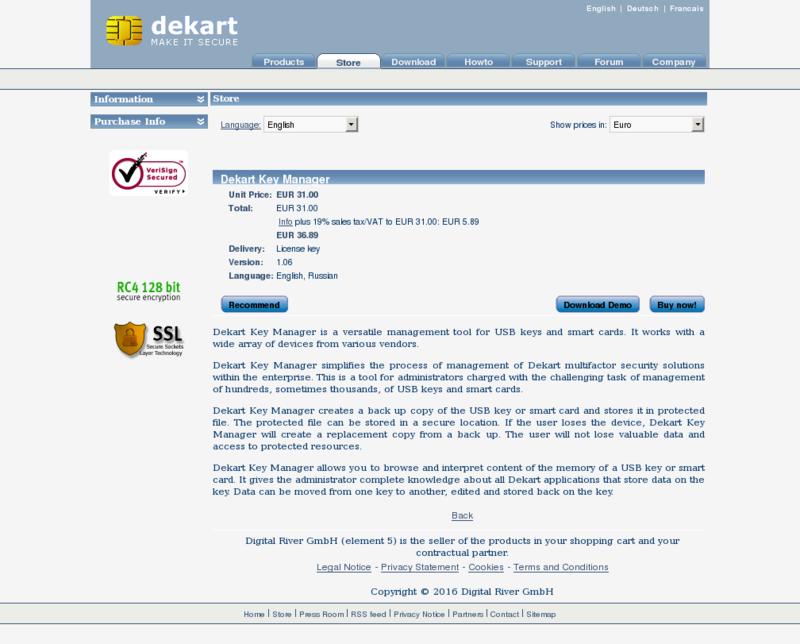 Dekart Key Manager allows you to browse and interpret content of the memory of a USB key or smart card. It gives the administrator complete knowledge about all Dekart applications that store data on the key. Data can be moved from one key to another, edited and stored back on the key. Dekart Terminal Logon is a solution designed to provide an additional level of security for remote users of Linux and Unix (remote connections with SSH and Telnet protocols). Dekart Terminal Logon is intermediary access software, that performs user authentication for connections between client terminal programs and remote servers using Telnet and SSH protocols. Due to the in-built SSH client, Dekart Terminal Logon allows any Telnet terminal program work with SSH servers. This becomes very important when migrating from systems using insecure Telnet protocol to systems using the SSH protocol (a protocol complying with higher security standards). Dekart Terminal Logon makes it possible to use Telnet terminal programs, thus making the migration transparent for the user and simpler for administrators. Reinforced three factor authentication – Dekart Terminal Logon offers a combined hardware and software approach in the form of a USB key, smart card and/or a fingerprint reader, ensuring additional security that cannot be achieved with simple password based solutions. Account information is stored and updated on a Key Storage Device (KSD) – USB token, smart card, or fingerprint authentication is used to grant access to the required resources. Connection to the server and authentication are automatically performed without user interaction. The need to remember account information is eliminated, thus the impact of the human factor on information security is reduced. Easier logon procedure for users connecting to a remote system. Less time-consuming routines for managing the authorization system in the event that the number of users or their access rights change. Cost-effective pricing – The price for Dekart Terminal Logon is as low as 39 USD, volume discounts apply. Dekart Password Manager memorizes and securely stores your online and offline passwords, so you will never forget them again. Now you can automatically log on into online accounts, complete online registrations and fill in website forms with one click. Dekart Password Manager offers you peace of mind, portability and absolute security. Dekart Password Manager works directly from the USB key drive (or any portable drive), with no host PC installation. Remove the drive, and all your passwords and user accounts are removed with it. Now you no longer need to worry about forgetting a complicated password to your favorite forums, websites or company’s internal database – all of the data remain with you wherever you are. You do not risk getting your data into the wrong hands – as the USB drive is protected by 256-bit AES encryption. Automates web logon and online registration processes. Protects your passwords and private data with USB key/smart card and biometric authentication. This makes the risk of privacy exposure virtually nil, even if your flash drive is lost or stolen. With SIM Manager, you can easily create, edit, and backup phonebook entries using your PC and stop typing in information using the mobile phone’s keypad. Manage your PIN codes, transfer data from one SIM to another, backup and export/import all phonebook entries. Dekart SIM Manager is a versatile software designed to suit the needs of both individual customers, looking for a fast and efficient tool for managing their contacts, and GSM operators, requiring such special features as possibility to view SIM serial number, PIN1 state, technical data of the phonebook, its memory size and the number of free entries. Dekart SIM Manager stands out from the competitor products by its ability to create phonebook entries in ANY local character set used by Windows operating system. Local language characters are correctly displayed on the screen of your mobile phone. Dekart SIM Manager has the option of performing backups and then restoring the SIM card phonebook data. Dekart SIM Manager allows importing and exporting the address books of Microsoft Outlook Express, Microsoft Office Outlook, theBat! and other address books in CSV format. Dekart SIM Manager allows changing, unblocking, activating and deactivating SIM card’s PIN code.